HCL Foundation’s biggest corporate social responsibility project called ‘Samuday’. Samuday is a rural development initiative to create model villages, which has touched lives of around 6 lac people in the state so far. HCL Foundation, the corporate social responsibility arm of HCL Technologies, launched Samuday in 2015. Currently the project is being implemented in three blocks of Hardoi district of Uttar Pradesh. Since its launch, Samuday has impacted around six lac people in 90000 households across 720 villages through various interventions in the fields of education, agriculture, health, water, sanitation and hygiene, infrastructure and livelihood. Through the project, HCL Foundation is working to create a source code for sustainable and replicable blueprint for model villages. With the development of these model villages in Uttar Pradesh, the aim is to empower the people to help them make informed decisions and enhance the quality of life for themselves and their children. Towards this aim, HCL Foundation through Samuday is working with central and state government, village communities, NGO’s, knowledge institutions and allied partners. In a little over two years, Samuday, has set up over 380 information and communication technology-based classrooms and enrolled 1865 people for adult literacy programme. Samuday has also engaged 5000 farmers under various interventions and has constructed 5500 toilets, which are currently under usage. In addition, 49 mini solar grids are being set up across 63 villages. Through various preventive, promotive and curative health services we have been able to support 2000 pregnant females and 7000 severly acute malnourished children. There has been a marked improvement in the nutrition intake of the village communities through the concept of Nutrition Garden in every third household of the village. Through this more than 5000 farmers have been engaged under various interventions and going forward HCL envisages a vision wherein 100% marginal farmers are aware of modern and sustainable agricultural practices. “HCL Samuday will help us bring a positive impact through its various interventions in the areas of Education, Livelihood, Health, Infrastructure, Wash & Sanitation and Agriculture. We thank Uttar Pradesh government for their continued encouragement and support,” said Navpreet Kaur, Director, Project Samuday. HCL, a diversified global enterprise, is committed to its core belief of ‘Touching Lives’ and through HCL Foundation established in 2011, the enterprise aims to build inclusive growth and development of the larger social consciousness, which is essential for the unified progress of the nation. 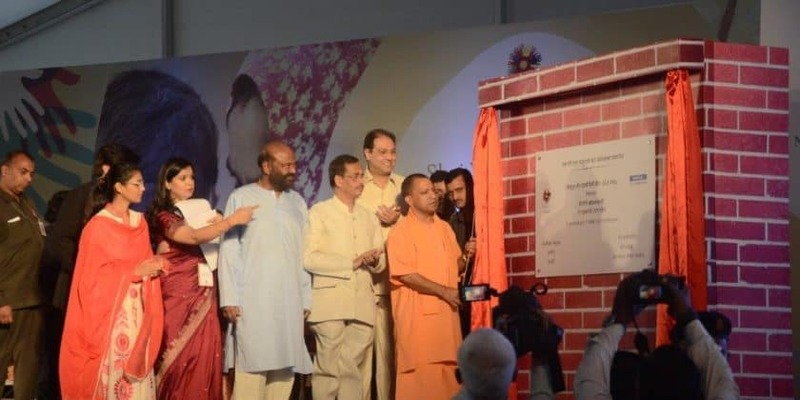 UP CM Yogi Adityanath Unveils CSR Initiative by HCL– Samuday 0 out of 5 based on 0 ratings. 0 user reviews.